So what we have here is a Crosman Challenger CH2000 CO2 airgun, that developed a problem with the initial loading of a fresh Powerlet CO2 gas cartridge. Once the powelet was inserted, and the gun was prepared to fire with the initial piercing of the CO2 cartridge, upon the initial release of the trigger, all the gas from the powerlet escaped in a whoosh. Once I disassembled the airgun, I discovered that the face seal gasket that sits in a recess at the forward end of the gas release valve was damaged. The Crosman part required is a G397-012, and this face seal gasket is also used in Crosman model's 2240, 2260, 2250 airguns as well as the Challenger CH2000 and possibly other Crosman CO2 airguns. I suspect this face seat gasket was damaged due to over-zealous tightening of the knurled knob/plunger assembly, that retains the Powerlet CO2 gas cartridge in place against the face seal gasket that resides at the forward end of the gas release valve. 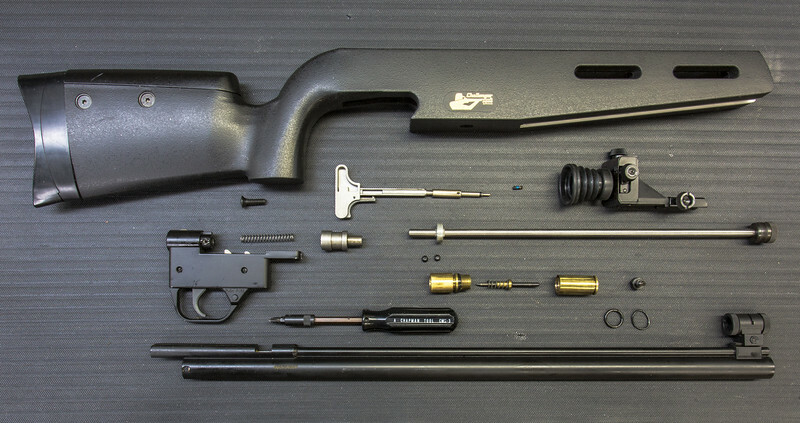 Click on the photo for a closer look of the disassembled Challenger CH2000 airgun.